After three days the protests are growing. Hundreds of people gathered infront of the port in Mytilini and marched the city streets for hours. It was the first protest where many different nationalities marched together under the same slogan, “We want freedom!” and you could see the uniting power of the people. The demonstration returned to the port where, to everyones surprise, the gates stood open and unguarded. Excited, people started running towards the ferry in hope of going to Athens. Despite their big numbers, they met resistance from the police and military, who forcefully evicted the port. Nevertheless the group continued to the main square of Mytilini where it was decided to keep the action running with more protests in the next days. After months of repression, frustration and fighting each other the people are uniting, selforganizing and fighting together for their rights. We hope the protests will keep growing and we are looking forward to the next days. United, the people will never be defeated! No borders! No nations! Since the 23rd when people from Pakistan protested for papers there were other demonstrations. For example on the 25th people rose up for freedom of movement and against the conditions in the detentioncenter Moria. On the 23rd of May over 150 people protested for legal papers, some went on a hungerstrike. In the last few days people of some nationalities (for example; Syrians, Afghanis) have gotten papers allowing them to move to the mainland for interview in their asylum process, while others (for example; Pakistanis, Moroccans and Algerians) are still stranded on Lesvos being denied the right to apply for asylum. For that reason the group marched in the morning from Moria towards Mytilini stopping for a few hours outside a small town, Panagiouda. Support the struggle! Fight fortress Europe! Freedom of movement for all! Report from inside – Inside Moria the conditions for food are worse than hell. We have to wait in lines, our whole day we spend in waiting for food in huge cues. We have to wait in line for two hours just for tea and we get pushed back and forth. People get hurt, just for a cup of tea and only the lucky ones manage to get it. It starts at 7:00 am in the morning. We have to strive for tea. It is like a jungle. People wake up to get in a cue for two hours just for a cup of tea and two biscuits. And then people start looking for breakfast. Again people stand in a cue for three hours for a piece of bread and a juice box. S.O.S. Remar people distribute the food and they don’t do a good job because they don’t care. There are a lot of fights and people get injured everyday just for food. It is normal. Not everyone gets food in the end. By the time breakfast is finished at 1:00. And after the breakfast the struggle starts again. The lunch struggle is the same. Some people get food and others wait for hours for food and still don’t get any food. I just saw a really ugly fight between two Syrians and three Pakistani’s in the struggle to get food. I don’t understand how people can fight just for food. I saw all these people injured really bad all of them were bleeding. I couldn’t stand it and started to cry. It is a circus every day. People get seriously injured and it’s fun for the cops and the military to watch. They don’t break up the fights, they just stand laughing and watch the people fight from a distance. You can see it on their faces that they are happy and smiling during the fights. This tears me up completely. I could never have imagined this. It is a slap in the face of humanity. I want to talk about food again. The struggle for food isn’t over and people start striving for dinner.The whole mess starts at 9:00 pm and people are forced to stand in lines again. The whole day just passes like that and at the end not everyone gets food. This pattern of living shocks me. Our whole day is standing in the lines waiting for small portions of food. This is Hell. Policemen are happy and smiling during the fights. People are being treated like animals – or sheep to be honest. 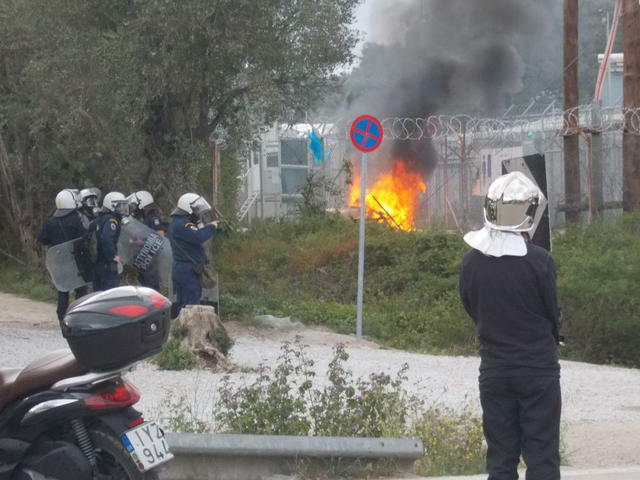 On the 26th of April, on the island of Lesvos, there were riots in the detention center of Moria. This day the Greek vice-minister of immigration, Muzalas, visited Moria to have a look at the situation inside. The minors in Moria are officially not allowed to be kept imprisoned, so they get to go out for half an hour every day. These 30 minutes out is the big thing of the day, what the minors are waiting for every day. On the 26th, they where not taken out at the usual time, assumable because of the visit of the vice-minister, and hour after hours of waiting they became more furious that they where not let outside. To express there rage they threw water over the vice-minister, who was removed out of the prison wet directly for his safety. A few minors started to rebel further on by setting things on fire, presumably trash bins and other burnable materials. The police reacted by beating up these minors, which enraged more and more minors. Around 4 o’clock they started to rebel at the main gate of Moria, setting trash bins on fire and throwing rocks at the riot police (who is stationed just outside the main gate of Moria 24/7). The riot police went inside but had to pull back after a few minutes, running for there lives together with translators, Frontex officers and people who work in Moria. The riots spread to different sections of the prison, where refugees managed to break down the fence and go outside of Moria to seek confrontation with the riot police. The riot police was clearly outnumbered and unprepared, and the refugees had the chance to seek confrontation with the police for hours. Teargas was shot without effect since there was no wind at all. The refugees managed to break into the office that has control over the main speakers in Moria, shouting ‘freedom’ over the speakers hear-able all over the camp, and got entrance to the registration center where they destroyed documents and computers. In the night people started to climb on top of the buildings, set up more fires threw the camp and attempt to destroy the buildings itself. Also there were several more attempts to destroy fences on the inside. In the end the police went back inside, trying to desperately break up the riots by shooting several flashbang grenades at short distance, presumably aiming straight at refugees. 5 ambulances where driving on and off the site, unknown whether they were taking wounded cops or refugees to the hospital. What happened after that remains unknown, since the police ordered the last witnesses to leave the area and the police then shut down the complete road to Moria on both sides, making it impossible for anyone to get close. In the morning the situation was calm again. For us these incidents show that humans can not be kept imprisoned without having an emotional reaction of resistance to it. We support refugees in there struggle for justice, acknowledgement of their situation and existence in Europe and abroad by the European Union, and we support them for their FIGHT FOR FREEDOM! Freedom for all prisoners now! These pictures of the conditions in the showers of Moria were sent to us yesterday. Although we know how much the EU “values” human dignity these days, we are shocked and devastated by the conditions humans are forced into by the deportation regime europe and its allies just because they practiced their right for freedom of movement. We will continue fighting nations, borders, prisons and the criminalization of people refusing to fit into your cages. We will not be discouraged by the repression that is put onto us and we will continue staying with our friends that are deprived of their dignity. We will fight together and we will not stop until we are able to live a live that is worth living for everyone. NO JUSTICE, NO PEACE!